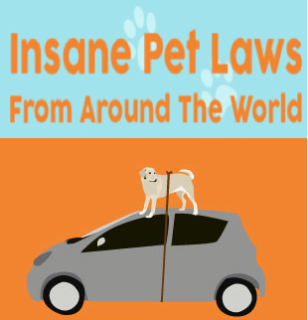 We’re sure if you’ve been a pet owner for any length of time (dependent on what part of the world you hail from) you’ve probably come across some very bizarre and strange laws pertaining to your furry, scaly or feathered friends. But taking it one step further, the UK pet insurance firm Helpucover has pulled out all stops in posting some of the most ridiculous laws that may have slipped by you. Pet laws in and of themselves normally go way beyond the daily chores that accompany taking care of your pet. Whether you own a dog, cat, lizard, guinea pig, parakeet or even a sheep, if you’re claiming them as pets, best to check your state and country laws to see what’s acceptable and in accordance with the legalities pertaining to a master/pet relationship. Whether it's illegal to tie a dog to the roof of your car in Alaska (take a note, Mr. Mitt Romney, 2012 presidential candidate), o r affixing a bell to your black cat in French Lick Springs, Indiana on Friday the 13th, you have to wonder sometimes, where common sense stops and legal boundaries begin. Though some of these laws are incredulous, this type of legislation is said to be legit, and has been creatively illustrated and satirized in a Helpucover’s infographic on this subject. As with other types of laws handed down through the centuries, it's understandable that many have just been forgotten and the lawmakers haven’t got around to striking them from the books. Nonetheless, it’s a brave cat that risks appearing in public after 8pm in Japan - just saying! 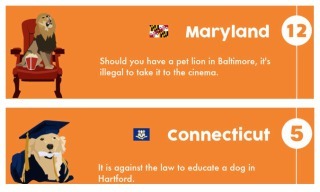 For your amusement and enjoyment, the complete Helpucover’s infographic of ”40 Insane Pet Laws” can be found here.